We all love Panera Bread, yes? It is one of my favorite little cafe type places to stop at. Their salads and soups really make me happy. The broccoli cheese is one of those. This recipe is super close. SUPER. This is one of my daughters favorite soups and she squeals with delight when she hears that is what we are having for dinner. Cook melted butter and flour using a whisk over medium heat for 3-5 minutes. Stir constantly and slowly add the half-and-half (this is called making a roux). Add the broccoli, carrots and onions. Cook over low heat until the veggies are tender for 20-25 minutes. Add salt and pepper. The soup should be thickened by now. Pour in batches into blender and puree. Stir in the nutmeg and serve. Yummy – thanks for sharing! How many servings does this reciepe make? I can't wait to try it. Ummm Jean…DH and I can have 2 bowls the night we make this, then maybe a bowl or two for leftovers the next day. 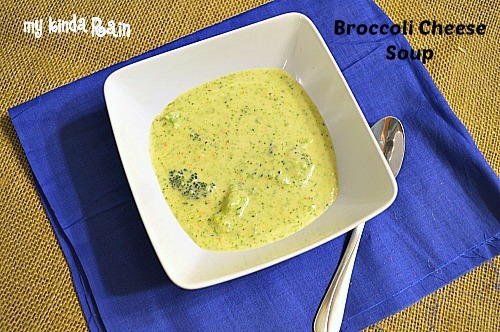 Panera has the best broccoli soup! I can’t wait to try this at home. That sounds so good right now, would warm me right up. I love creamy based soups.